Getting everyone in your group to agree on which restaurant to hit up for lunch isn’t always the easiest feat… and that’s probably why the culinary powers-that-be created food halls, gloriously spacious spots that are home to multiple food purveyors all within mere feet of each other. 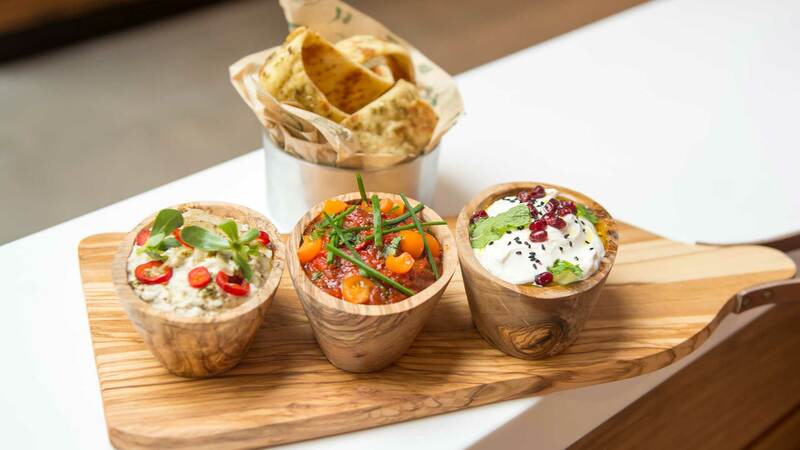 We’re not talking ‘80s-style mall food courts here, but instead, high-end halls doling out everything from gourmet grub to creative twists on ethnic cuisine to vegan versions of old favorites. Here, four fabulous food halls near The Hollywood Roosevelt to nosh your way through. 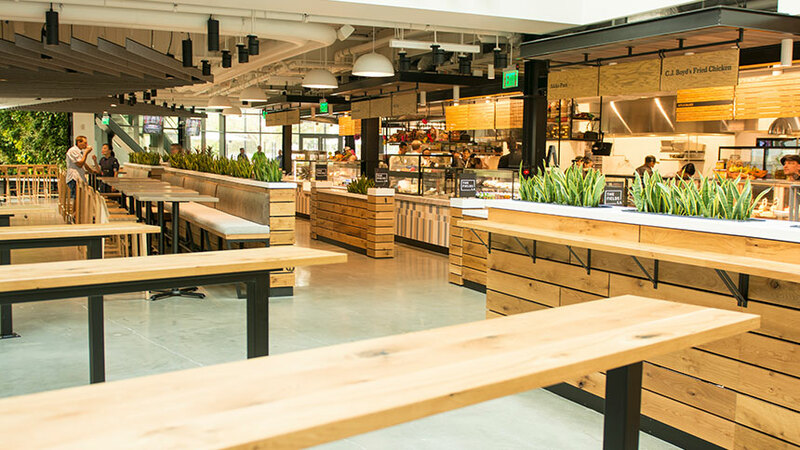 This historic food hall has been around for more than a century and – like Downtown LA itself – has seen plenty of serious changes in recent years. The result is more edible options than you’ll be able to consider even if you stay all day. (Hey, there’s always next time!) The now-modernized market is home to more than three dozen purveyors, and while many of the old-school stalls disappeared after the market underwent a revamp, several still remain, including wonton soup and Chop Suey stalwart China Cafe and beloved no-frills Mexican joint Roast To Go. For buzzy new favorites, try Wexler’s – a millennial version of a Jewish deli with house-smoked fishes and sky-high pastrami sandwiches; the I-can’t-believe-it’s-vegan ramen counter Ramen Hood, which uses the almighty sunflower seed to thicken its broth; and Thai street food counter Sticky Rice. Goodbye, stale soft pretzels and neon-orange nachos. Hello, ceviche and Sangiovese at brand-spanking-new The Fields LA, a multi-level food hall servicing the Los Angeles Football Club’s new Banc of California Stadium on the campus of USC. Try jambalaya at soul food spot Barbara Jean, veggie-spiked glass noodle salads from Chinese-with-a-twist outpost Ms. Chi, and falafel and flatbread from Middle Eastern eatery Akko Port, and you’ll soon realize that the fare is better than anything you’ve had remotely near a stadium before. In addition to the nine quick-service food vendors, there are beer, wine, and cocktail offerings and an expansive outdoor patio. Look to Otium chef Tim Hollingsworth (who’s already got fried chicken sandwich spot C.J. Boyd’s onsite) for the unveiling of Free Play – the upstairs restaurant and bar with games, a DJ booth, and live music – later this fall. 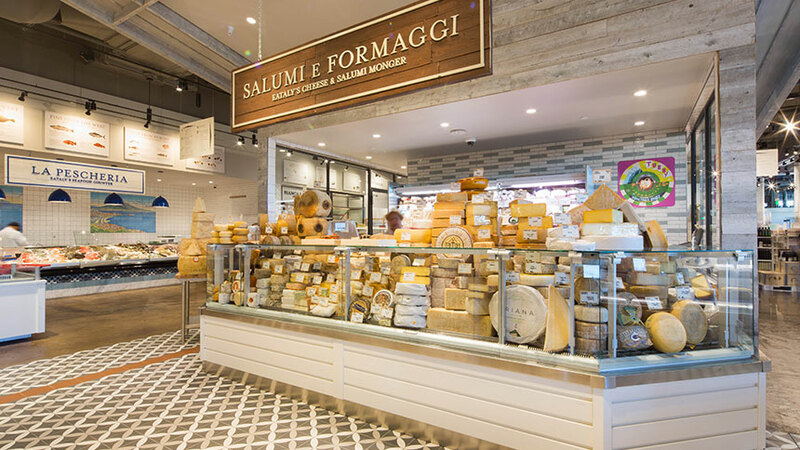 In its quest to conquer the world, Italian-everything food hall Eataly finally opened its first West Coast location last year right here in LA. And like those that have come before it, the place is not just a pizza and pasta wonderland (though it’s definitely that) but also a spot to stock both your pantry (with gourmet imports like olive oil, dried linguini, and truffle salt) and your fridge (with pizza dough, sauces, and an impressive fresh fish selection). Among the marketplace’s tasting rooms, faves include La Piazza, focused on small bites and sharable platters of standout salumi and housemade mozzarella, and seafood-centric Il Pesce Cucina, a collaboration with LA’s beloved seafood chef Michael Cimarusti. Another solid option is to snack yourself silly at the counters serving up panini, pastries, gelato, and more. This past spring, Terra, the open-air rooftop restaurant and swanky gin-focused cocktail lounge, opened with one of the prettiest patios in town. And be sure to check the calendar for Eataly’s classes, demos, tours, and tastings taking place all year long. This small-but-mighty collection of eateries focuses on doing a few things really well with seven stalls showcased in the sleek space. Mix and match fresh pastas and homemade sauces at Italian-inspired Funculo, take on tacos and tostadas at Latin-inspired Chiquitita, and fill up on cinnamon-spiced chicken and cornbread waffles at South City Fried Chicken or Pad Thai and Pork Belly Rice Bowls at Buddha Belly. 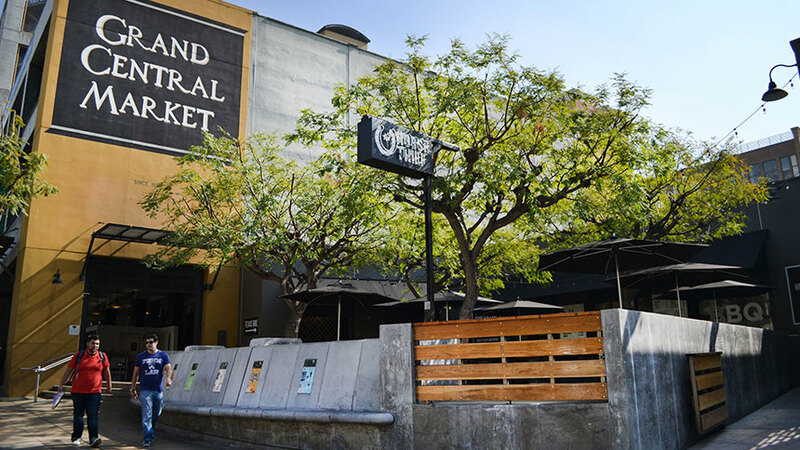 Coming Soon: Look for Santee Passage – by the same folks who worked on Grand Central Market’s update – in Downtown LA’s Fashion District in early 2019. And an Asian-inspired market called Cravings is slated to open this fall, offering both an Asian-inspired food hall with a modern twist along with a warehouse-style supermarket in the Inland Empire’s Chino Hills area, about 35 miles outside of LA.